Under Richard Di Natale the party has adopted a more pragmatic style. During the election campaign he celebrated the way The Greens have become part of parliamentary wheeling and dealing and “used our influence and demonstrated our ability to negotiate important reforms”. The Greens’ period working in minority government with Labor, and more recently working with the Liberals to pass bills through the Senate, has made them look more like part of the political establishment. There was a modest increase in the Greens lower house vote of 1.5 per cent, recovering some of the losses of the last election. But they lost one Senator, in South Australia, as their vote declined in the upper house. The party’s best results were in Melbourne, where it came close to winning the seat of Batman. Alex Bhathal received a 10.5 per cent increase in her primary vote but Labor has held on. There were also large increases in their vote in Wills, Melbourne Ports and Higgins. Adam Bandt easily retained his seat of Melbourne with 44.5 per cent of the primary vote. Grayndler, where The Greens had their best chance in Sydney of winning a seat, was a major disappointment. The Greens’ vote actually declined and the party remained in third place behind the Liberals. Sections of The Greens have attacked the NSW branch for running a campaign in Grayndler that was “too bolshy”. Labor attacked Greens candidate Jim Casey as a socialist who wanted the end of capitalism. This was just a cheap shot. The Grayndler campaign was no more left-wing than elsewhere, focusing on the local WestConnex motorway and climate change (read coal mining) rather than a clear anti-Turnbull stance. Labor’s campaign in defence of Medicare, public education and opposing Turnbull’s tax cuts for big business offered a more explicit defence of working class interests. Casey made a point of his background in the firefighters’ union, but there were no unions that formally backed his campaign. This was a crucial component of Adam Bandt’s initial breakthrough in 2010, which received endorsement and donations from a number of left unions. Local Labor MP Anthony Albanese also retains a left-wing reputation and Labor still have deep community roots to draw on. The Greens’ support for Senate voting reforms, which opened the door for the re-introduction of the ABCC, did not help. The Greens were attacked by left unions like the CFMEU, which had previously supported them in the Senate. But The Greens simply ignored the issue, helping contribute to the view that workers’ rights were not a central priority. The Greens’ successes in Melbourne have been based on an increasingly single-minded electoralism and a professionalised machine that organised months of door-knocking and phone calls to voters. This simply results in a Greens campaign that tailors its approach to maximise votes. And it is part of a strategy based on the idea that social change can be brought about by a process of winning this or that seat in successive elections. They even made Higgins, a blue ribbon Liberal seat, one of their four “target seats” in Victoria. But taking such a seat requires winning over significant numbers of Liberal voters from some of Melbourne’s wealthiest suburbs, including Toorak. Focusing on seats like this creates a pull to the right in order to appeal to traditional conservative voters. Di Natale showed where all this is taking the party in his pre-election address to the National Press Club. In the event of a hung parliament, he outlined the same approach the Greens took with Gillard in 2010, when they demanded the limited concessions from Labor that reduced action on climate change to the disastrous carbon tax. 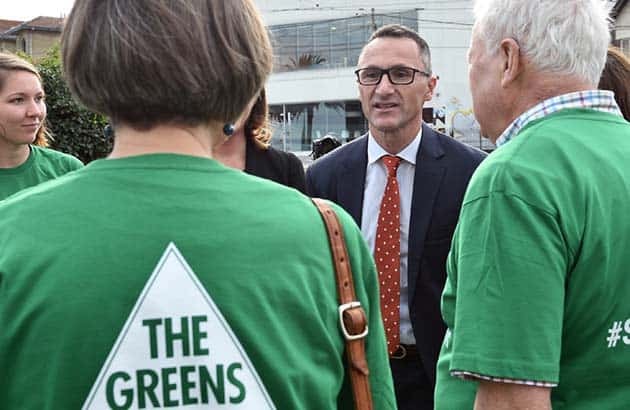 Only this time The Greens’ aims seem even more modest with Di Natale simply saying, “political donations reform and the establishment of a corruption watchdog will be one of the key issues in any negotiations”. Afterwards he described The Greens’ opposition to detention on Manus Island and Nauru as “the starting points of any negotiation”, indicating that closing Manus and Nauru would not be a threshold issue for any deal with Labor. Whether over refugees, equal marriage or fighting further cuts, it is not The Greens’ actions in parliament that will be decisive. What matters is the strength of the movements in the workplaces and on the streets. If The Greens continue to ignore that, they will be left on the margins.